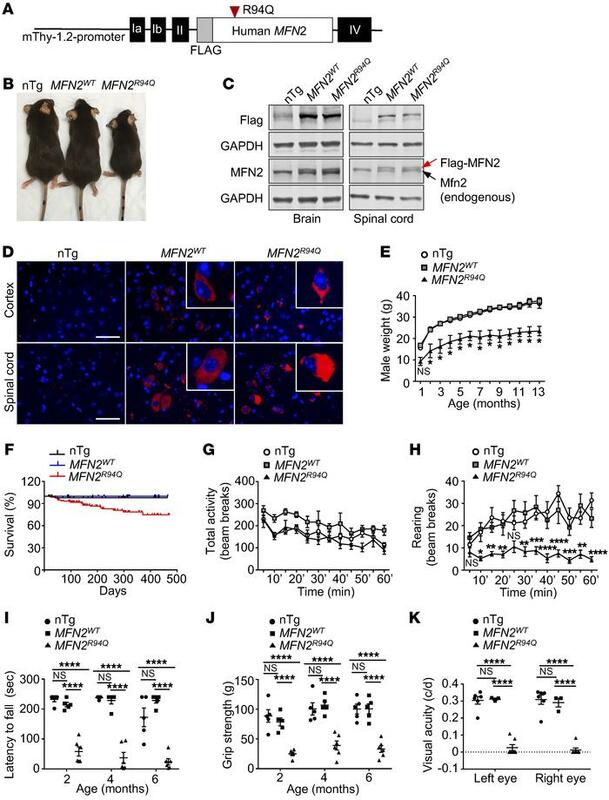 Impaired growth rate, sensorimotor function, grip strength, and vision in Thy1.2-MFN2R94Q transgenic mice. (A) Schematic of the Thy1.2-MFN2R94Q transgenic construct. The expression of human MFN2R94Q or control MFN2WT (N terminus tagged with Flag) was driven by the neuron-specific mouse Thy1.2 promoter. (B) Representative image of a nontransgenic (nTg) mouse, a Thy1.2-MFN2WT mouse, and a Thy1.2-MFN2R94Q mouse (5 months old). (C) Immunoblot of Flag-MFN2WT or Flag-MFN2R94Q transgene expression (14-month-old mice). Red arrow, Flag-MFN2; black arrow, endogenous mouse Mfn2. Expression levels of MFN2WT or MFN2R94Q transgenes were identical and slightly below endogenous Mfn2 levels. n = 3 mice/genotype. (D) Immunostaining of Flag-MFN2WT or Flag-MFN2R94Q protein expression and localization. Mouse cortex or spinal cord (5-month-old mice). Anti-Flag (red) and DAPI (blue). Scale bars: 50 μM. Punctate mitochondrial staining was observed in both transgenic lines, but only MFN2R94Q mice showed mitochondrial accumulations in neuronal cytoplasm and proximal axons. n = 3 mice/genotype. (E) Body weight. Data are represented as mean ± SEM. n = 6–52 per genotype per time point. Student’s 2-tailed t test (nTg vs. MFN2R94Q). *P < 0.05. (F) Survival curve. nTg (n = 59), MFN2WT (n = 29), MFN2R94Q (n = 124). log-rank test with Bonferroni’s correction. nTg vs. MFN2WT, P > 0.05, not significant. nTg vs. MFN2R94Q, P < 0.01. MFN2WT vs. MFN2R94Q, P < 0.05. (G) Open-field test (total activity) and (H) open-field test (rearing). Total activity was not significantly different between groups. nTg (n = 5), MFN2WT (n = 5), MFN2R94Q (n = 6) (3-month-old mice). (I) Rotarod testing. nTg (n = 5), MFN2WT (n = 5), MFN2R94Q (n = 6). (J) Grip-strength testing (forelimbs). nTg (n = 8–11), MFN2WT (n = 5), MFN2R94Q (n = 6). (K) Visual acuity measured by OKR. nTg (n = 6), MFN2WT (n = 3), MFN2R94Q (n = 7). In G-K, data are represented as mean ± SEM. Two-way ANOVA with Tukey’s test was used for multiple comparison. *P < 0.05; **P < 0.01; ***P < 0.001; ****P < 0.0001.